What is Biotta Apple, Beetroot and Ginger Juice? 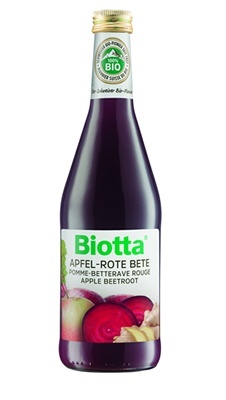 Biotta Apple, Beetroot and Ginger Juice is simply 52% organic apple juice, 47% beetroot juice, 1% lemon juice concentrate and refreshing ginger, with no added extras. All of the vitamins and minerals it contains come from nature! The Biotta juices are lacto-fermented which supports the production of naturally occurring, gut-friendly L+ lactic acid. In order to support your health naturally, the recommended serving size of Biotta juice is 100ml per day. Biotta juices are safe to use in pregnancy, whilst breastfeeding and as part of healthy diet and lifestyle for children. Due to the distinctive dark colour of the Beetroot juice it does have the potential to give your urine or bowel movements a slightly red tinge – if this happens there should be no cause for concern. Beetroot juice is high in oxalates so people with oxalate kidney stones may want to avoid it. Although generally relatively low in sugar, vegetable juices lack fibre which helps slow the release of naturally occurring sugars into the system. Those with diabetes should be prepared to take the natural sugar content of vegetable juices into account.